The first thing that struck me when watching David Michôd's The Rover is the chilling bleak, edge of your seat atmosphere that pervades every aspect of the film - most noticeably the personalities of the characters that fit into Michôd's dystopian not too distant future. The Rover's world is void of empathy and filled with a dog eat dog mentality where brother turns against brother. Michôd is no stranger to this type of world and the title of his brilliant 2010 debut feature Animal Kingdom even alludes to it. In an odd quirk or projection this is something I have been thinking about a lot recently - whilst watching a new TV show that takes place in a world where a chunk of the population simply disappears and those left behind deal with it in different ways - but ultimately everyone is angry, confused and the world forever tragically altered. Sadly the synchronicity with events rolling out in the Middle East and the effects seemingly bringing out the worst in many people. Highlights the condition of desensitization that people undergo after catastrophic events. This condition and its effects after the big one, the war to end all wars, Vietnam and the Gulf conflict are well documented and have changed the world as we knew it and this is something Michôd taps into. Whilst The Rover's world is its not to different from our own albeit a lot more broken and the effects have damaged man, further exacerbated by the unforgiving and barren setting of The Rover. The story Michôd tells is that of people pushed to the extremities of the human condition and whilst it is in essence a road or chase movie, for me it is more of a wild ride into the dark heart of man, that could have just as easily fit into a Western setting or sadly even contemporary times. 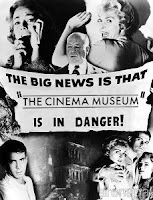 Being able to transport your audience to another world with enough credible hooks into our own is a hallmark of a great cinematic experience, it is also the hallmark of my favourite type of film – Film Noir. 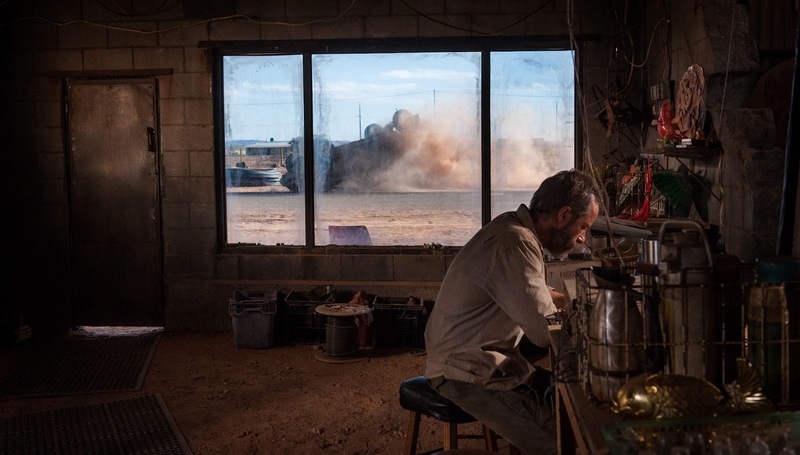 Which brings me to the second thing that struck me about The Rover – the performances. Like the great anti hero characters of noir Guy Pearce's Eric is broken, tough as nails and fiercely driven against the odds for his own reasons. It's a marvel, (albeit a fairly grim marvel) to see Guy Pearce transform himself into a physical and mental husk of a man, as he limps through the film leaving a trail of destruction behind him. Watching him I couldn't help but recall Antony Sher's Richard III as well Christian Bale's largely ignored but absolutely outstanding portrayal of a stooped blue collar steel worker in Scott Cooper's 2013 Out of the Furnace. In which Bale transforms himself into the character with his body, I'm not talking just about his highly publicised weight loss but his physical performance is something to behold - much like Guy Pearce's in The Rover - only on actually meeting the man did I realise what a stark contrast the character is to him, seriously, I'm as straight as an arrow but this man is very good looking with classic Hollywood star looks and a perfect bone structure. Robert Pattinson pulls in another impressive and understated performance as Rey, continuing his path to become his generations James Dean (without the tragedy). Taking on the role must be a fairly brave move considering Pattinson's heart throb status as his character the young Rey is somewhat stunted and underdeveloped, a condition all to prevalent in this day and age but Pattinson very easily connects with his youthful boldness, vulnerability and surprising moments of savant lucidity making Rey all the more tragic in his dichotomic role as perpetrator and victim - as well as the perfect counterbalance to Pearce's unblinkered and cynical rage. Of course I would be remiss if I did not mention Scoot McNairy's turn as a beleaguered hood, as he brings such personality and earnestness to each of his roles and I'm looking forward to seeing him in leading roles that hopefully don't diminish his poignancy. There are many scenes from The Rover that standout for me, some because of the dark humour, some because of the striking visuals, some where music and image come together beautifully despite the dark tone, some where you get a really good look at Eric's (Guy Pearce) haircut (the madness of which has to be seen to be fully comprehended) some like the scene where Rey (Robert Pattinson) is just sitting and listening to music because of its tragic poignancy and others like the ending which fell a little flat for me in its laboured and forced delivery as everything it had to say I heard throughout the film. I'm not the only one who was struck by some of these scenes and further below the team actually dissect and discuss them. Yet, despite the darkness there is a vein of hope and beauty - running through the barren strip mined landscapes, Composer Antony Partos and Sam Petty's soundtrack (often reminiscent of the haunting sound of someone hitting a barb wire fence in the middle of the night) and Natasha Braier' striking cinematography - underpinning the grim atmosphere. 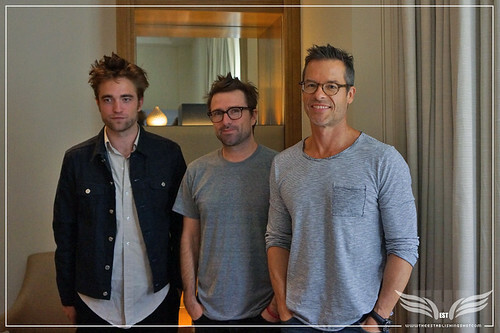 I was very taken by the depth of David Michôd's Rover, so you can see why I was keen to get in on a roundtable chat with Director David Michôd and it's stars Guy Pearce and Robert Pattinson to talk about their latest creation - The Rover. David can you tell us a little bit about your writing process, Animal Kingdom took almost a decade to script and with The Rover you initially went in one direction kind of took a sharp turn to somewhere else. I was hoping to explore how you get it all out of your head onto screen - as well as how you collaborate with people particularly Joel Edgerton. David Michôd: Animal Kingdom took a long time to write but largely because I was teaching myself to write over those 10 years. I started writing it straight out of film school. The first draft bears absolutely no resemblance to the finished film at all, there isn't a single scene or line of dialogue that is still in the movie and I started it from scratch about 4 or 5 times. Guy Pearce: It would be interesting to make that original script, with all of us playing different roles. David Michôd: Oh Wow! I'm glad that I wasn't like a film school wunderkind because then maybe someone would have thrown money at me to make that first draft. It would have been a disaster. I started it from scratch a few times because I could just feel in my bones that I was a better writer than the guy who had written the previous draft and there was no point to me polishing the turd. I just threw it out and started again. But also when I'm left to my own devices that gestation of story stuff can be slow. I have found that in collaborations with people like ; Joel (Edgerton) or Spencer Susser or I'm writing a thing at the moment with a great Australian writer Luke Davies, who wrote the movie Life that Rob just did, that I love that process of sitting in a room with a smart human being and just talking about life, and I also love the fact that it speeds that process up – problems that might take me 3 weeks to solve by myself can be solved in 15 minutes by another person. David Michôd: Well it's also because, er I don't know if its bad to spill other peoples trade secrets but [one of my collaborators] started experimenting with dictating his scripts to an assistant, and what he has found is that it speeds the process up incredibly, simply because you have another person in the room with you who is waiting for you to say something. When you are in that room by yourself, you'll write 5 words and pheww! I need a break. David after Animal kingdom and The Rover when are we going to see you do a Rom Com? You keep to go to dark places. David Michôd: Yeah, I don't know why. When I go to the movies I like to have powerful experiences, and for some reason that darkness, and menace and sadness is for me a powerful experience. As strange as it sounds those are the moments that I get most exhilarated when I am in an edit room. After writing and shooting and it comes together with sound and music, when its dark and powerful that's when I feel my spine tingling. Having said that I would love to have the experience of sitting in an audience watching a movie I have made that was making people laugh. I don't know whether I'm capable but I'd love to give it a try. People think I'm being facetious when I say that I think The Rover is really funny. Everything Rob does, especially in the face of Guy's character. I thought your song in the car was really funny Rob, how was that? Robert Pattinson: Yea, I thought it was so funny in the script. David Michôd: Did it feel funny when you were doing it? Robert Pattinson: No, actually it shouldn't have. David Michôd: It shouldn't have? Robert Pattinson: I was trying to telegraph for that scene. I thought it was pretty brave having that in the script. It was actually a different song at first, it was The Pussycat Dolls. But yea, when we found the Keri Hilson song. I had never heard it before I thought it was written for the movie, it felt like a really specific decision. David did you pick the song Pretty Girl Rock because, it stuck out so much? 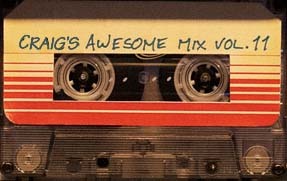 David Michôd: I wanted there to be, at that moment in the film a particularly a dark juncture for Rob's character, for there to be a moment that reminded the audience of the fact that his character was just a kid who in different circumstances would probably just be listening to music and thinking about girls. It felt very important to me that you have that one moment of that and also just a moment of levity as well, because the movie can be a little relentlessly grim without those moments of levity. 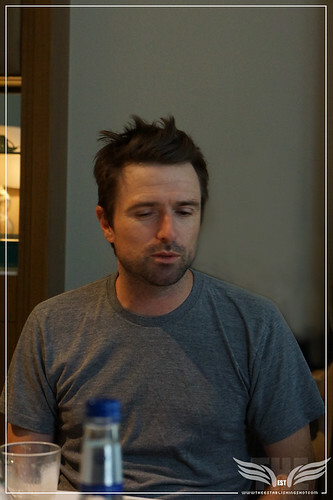 Rob, how did you find working in the Ozzy wilderness? Was it a bit of a culture shock? Robert Pattinson: Kind of. We were in a place that there wasn't really anyone out there. So I'm not sure of the culture. I think you said it was the most remote place you have ever filmed was it a nice change to get away from the hysteria, cameras and that side of things? Robert Pattinson: Yeah! Definitely it was kind of incredibly peaceful. You realise the value of anonymity again and how priceless it is. It was an unusual place and there was sort of mysticism of the area, its not just like being out in nothingness, there is an intensity to it. It was really hard. Almost savage. David Michôd: It's corny but it feels weirdly strangely spiritual being out there because you are kind of surrounded by a vast nothingness. But it is fun being out there too because when you are shooting in the city, you can leave work and have to have a shower, because you probably have a dinner to go to or whatever but being out there its fun just not having to care about anything, not caring about how filthy you are, not worrying about what clothes you are wearing. Guy Pearce: We were all in the same boat. On the subject of clothes, Guy the look of your character is very interesting, in certain scenes he looks like an exhumed corpse which makes the character a lot more powerful - how did the look of Eric come together? Did you have much input into his overall image? 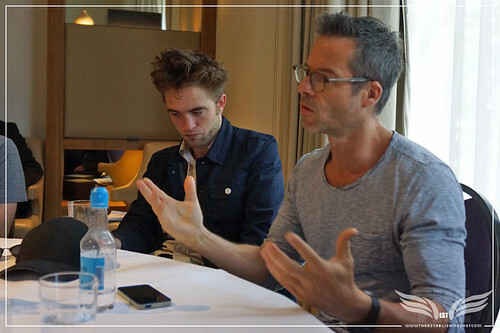 Guy Pearce: Well David had pretty clear ideas about what he wanted, but we would also then have a discussion. I think to a degree the description of the clothes was in there. David Michôd: Yes, shirt, shorts and sneakers. Guy Pearce: Yea, that's right. I was excited about wearing just wearing one costume for an entire movie, there is nothing worse than having to do a quick change. Was there much prep, did they dress you up a bit before you went on camera? Guy Pearce: What? Did you think – that's how I turned up [laughing]? I remember we had a whole lot of discussion about our haircuts and we sort of tried something and David would come in and say it was nearly there but not right. At some point he said I really want you to look like you found a pair of blunt scissors and you just cut it yourself. All about practicality. So I found a pair of old scissors and cut it myself. I think I might have been drunk while I was doing it. You've got to take that leap sometimes, you sort of have these ideas of what it could be, maybe it's this, maybe it's that and you realise you are still operating within some sort of conformity and eventually you just have to go f'it and hope people don't freak out the next day when you go to work. [To David Michôd], did you mean that when you said you wanted me to cut my own hair. David Michôd: Yea and you ended up giving yourself a really trendy haircut. Guy Pearce: It depends on what we were doing you know, but we were having fun, we pretty much had a good laugh on set. If we were doing a heavy, heavy scene it wasn't appropriate to ruin the mood. There wasn't a lot of background to your characters given to the audience, or the collapse in general, did you guys sit down a lot beforehand and discuss the background of your characters and their place in the film? Guy Pearce: Yea, pretty much as well as the week in Adelaide of rehearsals, which was really just the 3 of us in a hotel room getting to know each other and slowly going through the script. We, well I can't speak on Rob's behalf, but David and I exchanged emails and chats beforehand, because I was really struggling to get my head around who this guy was now, and who he used to be. So it was a bit of a laboured process for me to put David through to find him. David Michôd: That's what happens when you have a very taciturn character on the page, who doesn't reveal himself very much in dialogue. It requires you sit around and talk about it a lot. Robert Pattinson: Talking to you, I remembered having called you since the audition and a conversation about having the tops of his ears snipped off. I had read this thing about thieves in the Wild West who had the tops of their ears snipped off. I thought that was such a great little thing. Guy Pearce: So they could be more aerodynamic? Robert Pattinson: No it was a punishment, to mark thieves. I thought he was the type of person who would get caught and have his ears snipped off. Thank God I didn't have prosthetic ears in the end. Robert was there anything specific you did to get into character? Robert Pattinson: There was something, that I didn't really realise I was doing. All the guns were controlled by an Armourer, obviously very serious about guns. He got so pissed off with me when I started playing with the guns and I realised that is what was getting me into character – annoying the Armourer. I thought wow that is exactly what he would be doing, and being constantly told off. I was constantly clicking the hammer and I could see him sitting in the corner getting so angry. I was getting more and more into character irritating people. David Michôd: To be honest I don't really know. Sometimes it can be as simple as starting with something that is entirely meaningless and then find your way into it, find the things that feel meaningful. I don't have a book notebook that is full of stories that I must tell. Sometimes it feels like work to me to get into a thing I have to start from a place of hating everything and everything is a bad idea and this movie should not be made and I force my way into it. Force myself to love it - usually that comes from finding ways to connect it to love or sadness, or fear of death or whatever. For me, as weird as it sounds, The Rover is a movie about love. I wouldn't have been interested in making the film if it had just been a kind of boys-y, shoot em up, guys in the desert movie. For me the whole reason to make it was the relationship between these two characters and reigniting the potential for love of Guy's character and the lost kid who is just looking for someone to cling onto. That stuff is the reason to make a movie. Guy how was it for you to be working on an Australian movie again? Guy Pearce: Oh! It was fantastic obviously. Not just because its an Australian film but primarily because I got to work with David again. It was really interesting being out in that location. Someone said to me – it must be great working at home again! - well I don't live there. So it was quite a schlep to get back home at the end of the job. It's really satisfying on all sorts of levels, obviously every character you play is different so its hard to generalise but even with this one where the character is so extreme on some level and the character has gone to such an extreme place there is still something that you latch on to that is Australian when you are playing a character that is Australian. I know that it sounds really obvious but there are certain, rhythms or understanding that is very different from when you go to another country and play someone from a different country with a different accent. With a very different sense of logic or whatever. As I say this is an extreme character I got to play, he is not your everyday Ozzy, but even so there is still something very personally satisfying. David Michôd: Like you can wear it like a comfortable jacket. Guy Pearce: Yea. I always love working at home and try to as much as I can. The ending is pretty devastating, what was your reaction to it when you first read it in the script. Guy Pearce: I don't know. I think I remember talking to you [David] about it. I really struggled with who this guy was, so I remember calling or emailing David and saying I thought the ending was fantastic, but had to go back and go through the whole script again and was really just looking for who this guy was and that was sort of driving everything for me. I thought it was the most beautiful idea that you are sent on a particular kind of journey, for a reason you don't get to understand until the very end. It is something so personal and so representative of various elements of who we are and that was important to that guy. It sort of said everything about where he was in the world of the film. So I thought it was really a surprising and kind of beautifully sad piece of the puzzle that unfolds. I was really taken by it obviously. Guy Pearce: We were discussing this yesterday. Often really the differences are the people you are working with, so there can be massive differences between one film and another - purely because they are in different countries or different people but the budgets are the same. I think when it comes down to it and you are standing in front of the camera and you are acting and you have a director who wants a particular thing and you are just trying to successfully do what it is that you – there is no difference really. But if you stand back there are lots of executives standing around being nervous about lots of money, on a film like The Rover or Iron Man 3, although they weren't particularly nervous about their money and they were pretty confident about it, the whole Marvel team I think. But you are aware that it is bigger, in a way I prefer the more intimate situations, you can get answers out of the people you want answers from as opposed to hold on I need to find out from the hierarchy if we can change that word. With society in decline, the rule of law has disintegrated and life is cheap. Hardened loner Eric (Guy Pearce) travels the desolate towns and roads of the scorched and dangerous Australian outback. When a brutal gang of thieves steals his car and only remaining possession, they leave behind the wounded Rey (Robert Pattinson) in their wake. Forcing Rey to help track the gang, Eric gives chase. Determined beyond reason, unrelenting in the pursuit of his prey, Eric will go to any lengths to take back the one thing that matters to him. Written and directed by David Michôd (Animal Kingdom), THE ROVER will be released in UK cinemas on August 22nd. 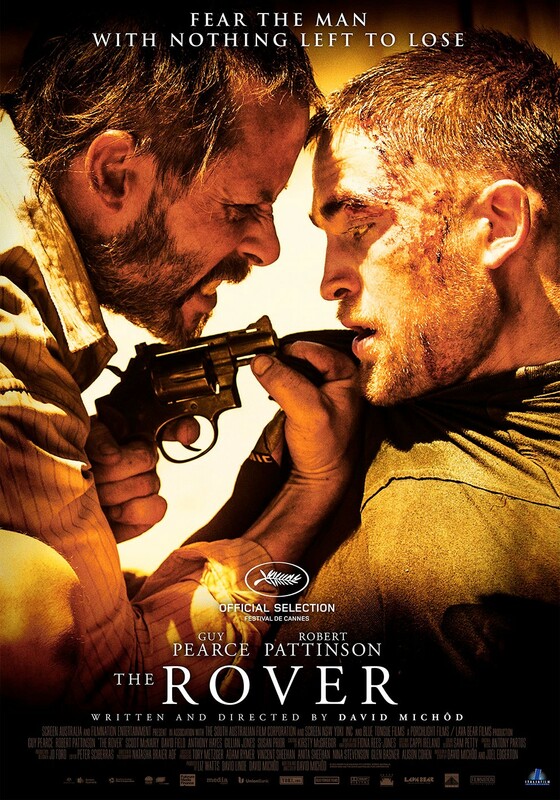 For more updates you can follow The Rover Filmon Facebook here https://www.facebook.com/TheRoverUK or on Twitter here @TheRoverMovieUK.